Constant ingress and egress are exceptionally tough on the outside portion of the driver's seat. To help minimize the seat from fraying, a seat wear patch on both the upper and lower bolsters is made of heavy-duty vinyl. 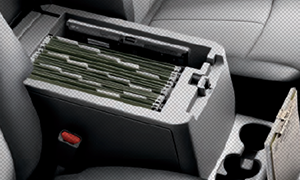 Another high-contact area, the centre console, is also specially treated. 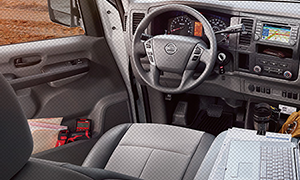 By minimizing engine intrusion into the cabin, the NV series' truck-like interior pays huge dividends in stretch-out room, especially leg and foot room (check out the deep footwell). The wide front seats feature a supportive anti-fatigue design, so you'll find the NV is a comfortable place to spend long hours on the road. Your truck is your office. Why not make it as efficient as possible? The NV series is extremely innovative, with big items like an available centre console with room for hanging files or a laptop computer. A top that slides forward to be a convenient workdesk, while the entire console is removable - a first in its class - for even more room. 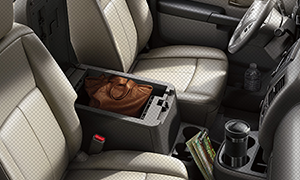 Youll also find a dedicated space for your clipboard, an under-seat storage area ideal for invoices and, on High Roof models, convenient overhead storage areas.1 Now let's get to work. 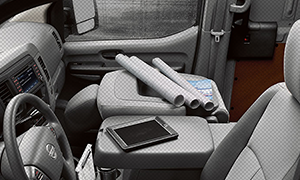 Business is all about connections, and in the NV lineup, advanced technology helps keep you in touch and on the move. The available Bluetooth® Hands-free Phone System connectivity lets you do business while keeping your hands on the wheel. On 2500 SV and 3500 SV models you’ll find one 120-volt, 400 Watt outlet inside the centre console and a second one in the driver-side D-pillar. When you need to print, you can set your printer on the fold-flat seat and plug it in. 2Availability of specific features is dependent upon the phone’s Bluetooth® support. Please refer to your phone Owner’s Manual for details. Cell phone not included. The Bluetooth word mark and logos are owned by Bluetooth SIG, Inc., and any use of such marks by Nissan is under license. 3The optional Rear Sonar System is a convenience, but is not a substitute for proper backing procedures. Always turn and check that it is safe to do so before backing up. The Rear Sonar System may not detect every object behind you. Find the Vehicle that Fits Your Needs!